On 8 September, 2017 the II International Youth Forum will be held in Almaty:"Youth cooperation in the field of strengthening intercultural dialogue and prevention of violent extremism". 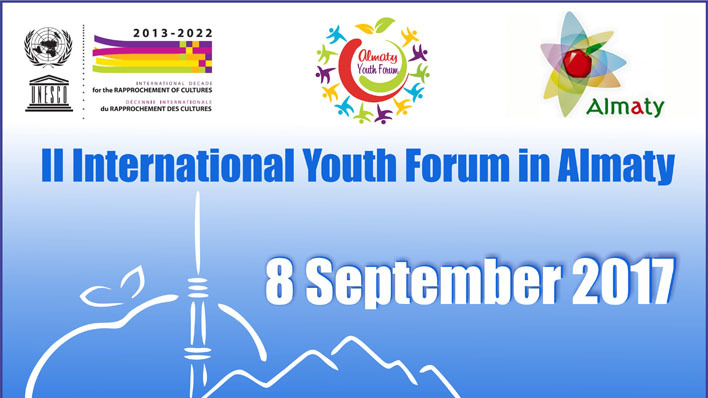 Within the framework of the International Decade for the Rapprochement of Cultures (2013-2022) and the International Youth Day the second Youth Forum is planned to be held in Almaty on the topic "Youth cooperation in the field of strengthening intercultural dialogue and prevention of violent extremism". The main idea of the Youth Forum is to bring together young researchers and activists from different countries to discuss main challenges of intercultural dialogue and to develop collectively recommendations for policy makers on prevention of violent extremism in the region. The objectives of the Youth Forum are to give an opportunity to young women and men to voice their concerns about challenges of intercultural dialogue in everyday life and to propose their ideas on prevention of violent extremism, as well as to raise the awareness of decision-makers, media and civil society about the importance of youth engagement in building peaceful societies and promoting sustainable development. o	Engaging youth in UNESCO’s programme activities/work. The expected results of the Youth Forum would include youth-initiated recommendations on prevention of violent extremism in local communities and strengthening intercultural dialogue. This document will be targeted at national governments, in particular Mayor Offices, NGOs and civil society. Additionally, the Youth Forum is expected to become a starting point of creation of youth networks in Kazakhstan in the relevant fields and allow young participants to engage with decision-makers in creation of inclusive, tolerant and cooperative society, based on mutual respect, human rights and freedoms. - foster youth creativity and innovation for prevention of violent extremism. The Youth Forum will consist of three sessions. The first session will give an opportunity to the participants to experience and to become more aware from experts about current activities in the field of existing cultural barriers, intolerance, xenophobia, hate speech, religious fundamentalism, racism and marginalization. Meanwhile, in the second session young participants will share their experience and ideas on prevention of violent extremism. In the final session participants will be separated in the several groups for brainstorming and collective formulation of recommendations. About 80 young people between the ages of 17 and 30 will take part in the Youth Forum. The applications will be accepted through the UNESCO.org/Almaty website. The organizers of the Youth Forum will conduct a final selection of participants, based on criteria such as the experience of candidates in social activities, promoting intercultural dialogue and prevention of violent extremism. Potential participants can be local and international students or representatives of youth organizations in Central Asia. Please note that the Organizers do not cover the expenses of participants for arriving in Almaty.